I came across the little book of poetry while holidaying this summer in Liverpool. It was deep in the back of an old secondhand bookshop, wedged in between Dickens and Austen and at first glance, I thought it was a prayer book. 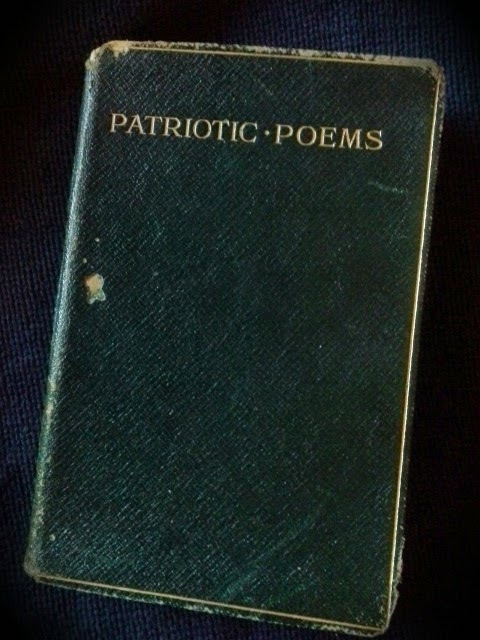 Covered in green faux-leather and edged in gold, it has all the solemnity that is so becoming in a poetry anthology that has patriotism and war as its theme, compiled as it was in 1914, the year the Great War commenced. The book itself is pocket-size, small enough to fit comfortably into one's hand, and indeed it is indented along one edge, perhaps by many years of being gripped, tightly, or so I imagine, and the cover bears a little scar where a thumb might have pressed down too tightly, too often. It is itself a battle-worn, hardly surprising, having survived two World Wars and being one hundred years old this year. The book begins with a poem by the Poet Laureate at the time, Robert Bridges, and ends with one by Robert Browning. In between are offerings by Shakespeare, Tennyson and all the great British writers that you can name and others that you may not be so familiar with. 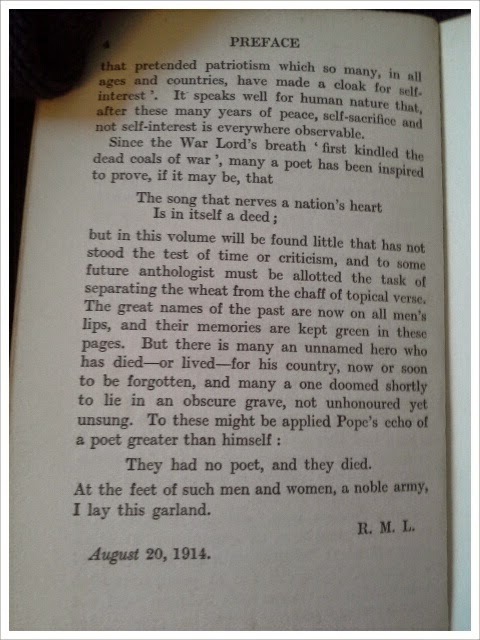 Bridge's poem is dated August 1914 and is a blatant call to arms, rather than a pensive reconsidering of war that modern readers are used to from the now famous WWI poets, like Owen, Graves and Sassoon. And so it goes. Other poems refer to the Napoleonic Wars, to Coruna and Trafalgar, and even others reference the Spanish Armada, Queen Elizabeth I and even the battle of Agincourt. To read these poems one might think that England has always been at war. In the 'Prefatory Note', the author refers to a war poem as 'a song that serves a nation's heart', itself a patriotic deed. He claims that this book of poetry will be as a garland at the feet of unknown, forgotten soldiers, 'now or soon to be forgotten', and says that it will be the task of future anthologists to separate the 'the wheat from the chaff of topical verse'. You will find no Rupert Brooke here, though his poem, 'The Soldier' would sit very well, in tone and timbre, with those that fill the pages of this publication, such as 'England, My England', The Path of Duty', and 'We Band of Brothers'. One cannot help but wonder about such a book; if it was carried into battle by some soldier buoyed, for how little a time, by its words of patriotism and self-sacrifice; or if it was cherished by mother or wife, who clung to its grandiose words for hope and solace. Either way, I think it must have been bought and read in the spirit of hope, the equivalent to a prayer, a wish that everything would turn out well. When I first came across the little book of poetry, I thought that it was a prayer book. I think that I was right. Thanks for posting this blog. It was quite moving. And it's interesting to get a different perspective on the war, from the early days, before they knew what they were actually getting into.